Sen. Henry M. “Scoop” Jackson was a tenacious, well-informed, defense-minded Democrat who played a central role in arms control debates during the 1960s and 1970s. He was a reliable vote for progressive domestic causes, and a deep skeptic of détente with the Soviet Union. Jackson favored missile defenses and was greatly concerned about trend lines in U.S.-Soviet strategic capabilities. He viewed the 1972 SALT I accords — the ABM Treaty and the “Interim Agreement on Strategic Offensive Arms,” which was sent to both houses of Congress for approval as an executive agreement — with deep foreboding. He valued the Kremlin’s potential advantages in land-base missiles far more than U.S. advantages in sea-based and bomber capabilities. Jackson was outmaneuvered on the SALT I accords by two cold warriors in the White House, Richard Nixon and Henry Kissinger, who wanted deals with the Kremlin and who understood the art of the possible – which did not include the deployment of nationwide missile defenses. The Nixon administration badly oversold the SALT I accords on Capitol Hill. 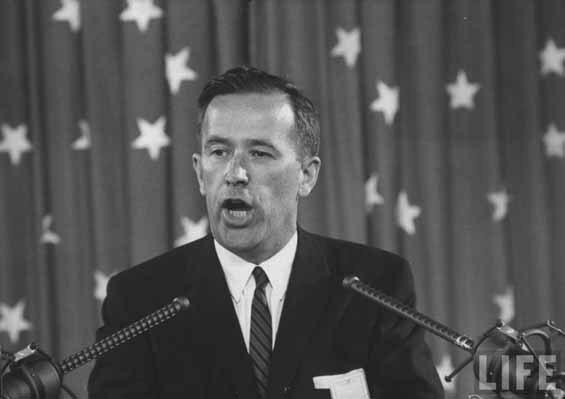 Secretary of State Wlliiam Rogers testified that, “A brake has been applied to the build-up of Soviet strategic forces,” and that, “As a result of our current success we are provided a more secure and stable strategic relationship with the U.S.S.R.” Secretary of Defense Melvin Laird testified that the SALT I agreements “move us closer to our ultimate goal – a world system in which peace is a universal practice rather than a hope.” Rogers was cut out of the negotiations by Kissinger, and Laird must have had a hard time keeping a straight face when he delivered these remarks. Jackson knew that the deck was stacked in favor of the SALT I accords. (Only two Senators voted against the ABM Treaty and the Interim Agreement.) His game plan was to seek overwhelming passage of a motherhood and apple pie amendment that would provide greater U.S. leverage in negotiations to follow, while also laying the foundation to critique the resulting agreement. As the amendment’s champion, Jackson positioned himself to become the arbiter of how poorly the executive branch fulfilled his guidelines. … urges and requests the President to seek a future treaty that, inter alia, would not limit the United States to levels of intercontinental strategic forces inferior to the limits provided for the Soviet Union. What could be more motherhood and apple pie than that? The Senate passed the Jackson amendment by a vote of 56 to 35 on September 11, 1972. Not surprisingly, Senator Jackson judged the Carter administration to be woefully deficient in meeting his standards for the SALT II Treaty. The Senator who now comes closest to emulating Scoop Jackson’s methods is Jon Kyl, who rounded up Republican votes to block ratification of the CTBT in 1996. Senator Kyl, as Jeffrey has posted, is now seeking to define what constitutes an acceptable strategic arms reduction treaty after the one now being negotiated by the Obama administration. Unfortunately for senator Kyl, however, the Cold War is over. Perhaps he ought to figure this into his future thinking. About 5 minutes of hard thought with a regular ol’ hominid brain is all it really takes. My post contains an error: Sen. Kyl is attempting to shape the contents of current treaty negotiations with Moscow, not the next one. I suspect that one reason why some of his co-signers joined him was to prevent Senator Kyl from being the sole arbiter of his amendment. There seems to be a forgetfulness amongst many proponents of continued nuclear disarmament of how far we have come since the end of the Cold War. The US is ALREADY on the path to reduce deployed strategic warheads to between 1700 and 2200. This is from OVER 12,000. Many arms control proponents language seems to imply that we have a Cold War sized arsenal today. Calling someone, politician or otherwise, who wants to maintain and modernize the current arsenal as “stuck in a Cold War mentality” is really disingenuous. As I have said on this forum many, many times there is absolutely no, none , nada, zip reason to reduce below the Moscow Treaty levels given the current geostrategic environment. Guess what? You have been wrong many many many times. That China will attack us and lose all the money we owe them? There is every reason to sit down with China and Russia and work towards reducing our arsenals to ~30 nukes each. ~30 nukes each is more than a sufficient deterrent to nations such as N. Korea who may be a future threat to us. China and Russia are our friends and trading partners — we have no reason to aim nukes at each other. None. 1700 nukes seems like a few because of our idiotically inflated baseline from the Cold War. Furthermore, we need to ditch the triad and just use subs. There was no rational reason to to a triad even in the Cold War — it was a defense dept. pork and influence issue. 1700 nukes is 1670 nukes too many. “Exactly these questions of “how much is enough” were raised fifty years ago in secret debate within the U.S. government, when Chief of Naval Operations Admiral Arleigh Burke argued that a small force of mainly nuclear missile-launching Polaris submarines was enough for deterrence. Burke and Navy leaders developed a concept of “finite” or “minimum” deterrence—highly relevant to today’s debate—that they believed would make the United States safer because it would dissuade nuclear attacks while removing pressures for a dangerous “hair-trigger” posture. In early 1960, when Eisenhower’s budget director Maurice Stans was told that the U.S. Navy’s Polaris missile-launching submarines could “destroy 232 targets, which was sufficient to destroy all of Russia,” he asked defense officials, “If POLARIS could do this job, why did we need other … ICBMs, SAC aircraft, and overseas bases?” According to Stans, the answer “he had received … [was] that was someone else’s problem.” An electronic briefing book of declassified documents obtained through archival research and published for the first time by the National Security Archive shows how the U.S. Navy, tried to take responsibility for this “problem” by supporting a minimum deterrent force that would threaten a “finite” list of major urban-industrial and command centers in the heart of the Soviet Union. That was during the Cold War. Far fewer are now needed.